Charlene Carruthers is a black, queer feminist who was born and raised on the South Side of Chicago, where she still lives. Charlene is the national director of Black Youth Project 100 (BYP100), an organization of black youth fighting for justice and freedom for all black people. How did the way Charlene was raised influence her decision to be involved in activism? How was Charlene’s college community different than the community she was from? Why was Charlene’s time in South Africa so transformative for her? How did the segregation in Chicago relate to the segregation in South Africa? What are some of the crises facing Chicago? Do any of these struggles relate to problems in your own community? Charlene says education should be “reflective of who you are and who you’re trying to become.” What does she mean? Are your own educational experiences reflective of who you are? Young people of color, people from the university community, and young white folks worked together to create the Trauma Center. How can uniting with different communities help a campaign be successful? Are there times when working with a broad group of people could create problems? Let’s explore Chicago’s history to understand its present day. In the video, Charlene describes students who are attending schools that may not be there next year. Use the links to learn more about Chicago’s closing of schools. Watch “Chicago Public Schools: Closed” about Chicago Public Schools closings. What is the racial and economic background of the majority of students who are affected by school closures? What are some of the concerns parents have about the school closures? How has the Chicago Teachers Union responded to the closures? Why are charter schools and private schools harder for some families to access? Imagine you are a student at a school that may close the following year. What do you think that would feel like? How would your teachers feel and act? What would you do to organize within your community to prevent the closures? Chicago schools, along with cities across the country, contribute to something called the “school-to-prison pipeline.” Learn about what the school-to-prison pipeline is and then discuss and answer the questions below. 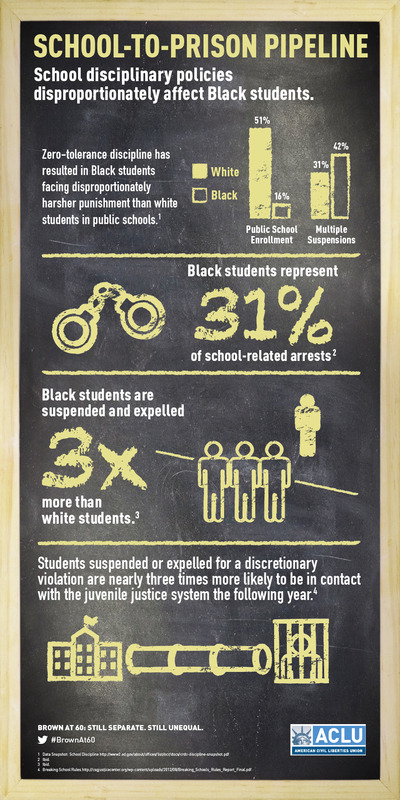 Does your own school have certain rules that contribute to the school-to-prison pipeline? In- and out-of-school suspensions have been shown not to help improve the behavior of students or the overall school culture. What are some alternatives to these disciplinary methods? How can students have an active voice in the culture of their school? What should teachers and administrators do when students don’t follow school rules? What is being shown in the cartoon? What skin color do the characters in the cartoon have? Why did the artist choose to draw the characters this way? Does the story shown in the cartoon relate to any experiences you’ve had at school, or maybe experiences your friends and classmates have had? Do you think the cartoon accurately depicts the school-to-prison pipeline? If so, why? If not, why not?